Terry Mitchell was a first-rate all-round endurance runner who excelled on the track , over the country and on the roads – he even ran in the World Mountain Running Championships! But in typical Scottish fashion, he is maybe best known for having been twice re-instated as an amateur athlete after two stints as a professional. This does an injustice to a top runner and the following profile by Colin Youngson indicates just how good he was. Terry was born on 23rd August , 1959. In 2007, Terry Mitchell was inducted into the University of St Andrews Sports Hall of Fame. His many achievements as a distance runner make this honour thoroughly merited. Terry is a Scottish International athlete for not only Cross-Country but also Road Racing and Mountain Running. He has had an unusual and interesting career and continues to race enthusiastically. Terry had a Lithuanian grandfather but was born in Kirkcaldy and lived in Star of Markinch. He attended Auchmuty High School in Glenrothes and started running because his PE teacher made him run round the playing field because he didn’t want to play rugby or cricket. He left school at 15, by which time he was training with local lads – 400m or 600m repetitions, maybe four times a week. This led to competing in the ‘Professional’ Games circuit in the Youths age-group, concentrating on one or two mile races, although his first actual victory was in the ‘Boys’ Marathon’ at the now-defunct Pitlessie Games. Then he moved to St Andrews, where he met Donald Macgregor, Ronnie Morrison and Ian Graves. Longer runs with them was hard at first. When he tried to be reinstated as an amateur so he could race for Fife Athletic Club, he was at first refused, but later this mean-spirited decision was reversed, which allowed him to do 1500m and 5000m races in the leagues, plus ten mile road races. This was just before the world marathon craze. Terry did complete one marathon unofficially, when ex-world-record-holder Jim Peters came north to give a talk. Mel Edwards felt sorry for tired Terry and gave him a bottle of wine! He made a real impact when he was fastest on Stage One of the 1981 Edinburgh to Glasgow Relay. Fife finished 11th. By 1999, Terry had run this marvellous race 14 times, on Stages 1, 2, 3, 5, 6, and 8. 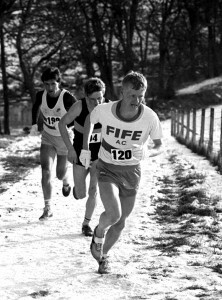 The peak Fife AC performance was 3rd place in 1998. 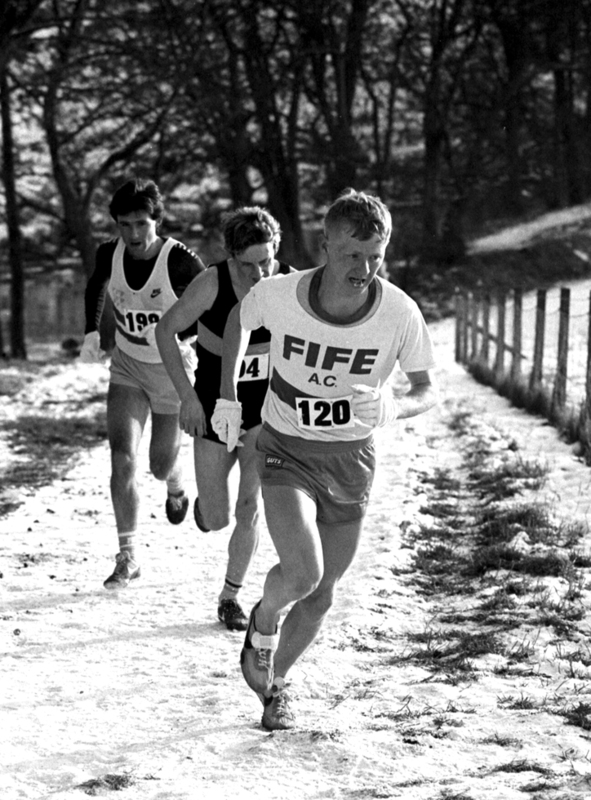 Terry showed a particular talent for cross-country when he finished 9th in the 1982 Scottish Senior National championship. In subsequent years he was twice 5th, as well as 6th and 8th. This consistency meant that by 1987 he had run for Scotland four times in the World Cross Country Championships, always finishing in the counting six. 1987, sadly, was the very last occasion when Scotland was allowed to enter this event as a nation separate from GB. Terry was second finisher for his country, well behind Nat Muir, but ahead of John Robson, Chris Robison, Tommy Murray, Neil Tennant, Charlie Haskett, Ross Copestake and Allister Hutton. Terry certainly took some wonderful scalps there! Other fine performances over the country included two wins in the East District CC (1984 and 1987). He was 4th Scot in the 1988 UK CC trial race, but 19th overall. Terry Mitchell’s first marathon was in Aberdeen in the early 1980s. Training included 20 mile runs and interval work with Don Macgregor, which helped him to 2.30 and an honourable mention in Athletics Weekly. In 1983, he made a breakthrough at the inaugural Dundee Peoples Marathon. He finished second in an excellent 2.20.50, behind his mentor and frequent training partner, the evergreen Donald Macgregor, whose career highlight had been a superb 7th in the 1972 Munich Olympic race. 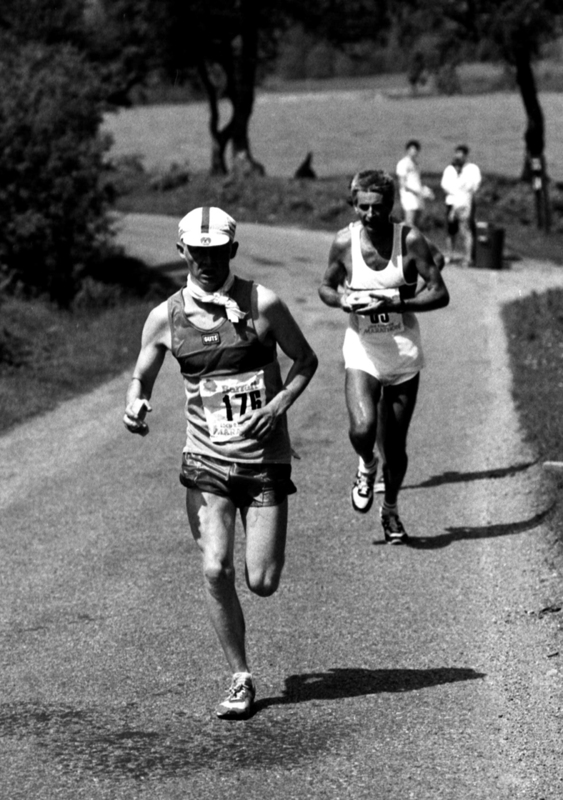 In the 1986 London Marathon, Terry improved his personal best to 2.18. In 1987 he was not only second in the Glasgow Marathon, but also won gold in the Scottish Marathon at Dundee (2.22.19), well ahead of Charlie Haskett (Dundee Hawkhill) and Ian Graves (Fife). On a hot day, Terry broke away during the first ten miles and was never really troubled after that. “The only problem was the last six miles, when I began to feel the pace a bit, but I got to the end okay.” It was reported that Terry Mitchell was working at the time as a St Andrews University halls of residence chef; and that he had made a cameo appearance in the opening sequence of the Oscar-winning movie ‘Chariots of Fire’ – filmed on St Andrews’ splendid East Beach – in which he was one of a group of athletes pounding along the sand. Marathon training might amount to 80 or 90 miles per week. One night might be a five mile warm-up followed by three two-mile efforts on grass, with a two-minute interval plus a good warm-down. Next night, a steady ten miles. The night after, ten times three minutes hard uphill. Otherwise steady ten miles per night, apart from Terry’s favourite: Sunday’s ‘Temple Run’, which might be 20 or 22 miles, starting with five miles easy, then six miles really hard, and a ten mile warm-down. In 1989 Terry won a Scottish Marathon silver (2.24.53) behind Englishman Ian Bloomfield (2.22.30), when the Aberdeen Marathon served as the venue for a Home Countries International race. The course and weather conditions were typically demanding. Bloomfield said, “It was tough, bloody tough!” after taking a severe buffeting from the strong north wind that battered many competitors into a state of near submission. However not long afterwards, upset by the lack of further opportunities for participation in the World Cross Country event, Terry opted once again for competition on the professional hill and track circuit. Another reason was his annoyance at the amount of appearance money paid to certain so-called ‘amateur’ athletes, but not to good runners like himself. However he soon became disillusioned by the limitations of professional racing and was reinstated as an amateur for the second time. A second Scottish Marathon Championship gold was secured in 1991 (2.24.50) at Inverclyde, Greenock. Terry dominated the race and won comfortably from John Stephens and Charlie MacDougall. 1992 was the date of the first Scottish Half Marathon Championship. At Glenrothes, Terry won gold in 66.59, just 23 seconds clear of Davie Ross, a prominent member of RC Edinburgh (Mizuno etc), who went on to win the event four years later. In 1993 Terry finished second in this championship (at Aberdeen), behind Mike Carroll (Annan AC). In addition Terry won the Loch Leven half marathon that year. 1994 featured a real battle in the Scottish Marathon Championship, this time held at Loch Rannoch. Both Terry Mitchell and Fraser Clyne (Metro Aberdeen RC) were seeking a third gold medal in this event. Terry took the lead and by ten miles he and his rival were well clear. At halfway, Clyne surged away uphill, but was startled when Terry zoomed past a mile or so later. By 19 miles, Mitchell enjoyed a lead of over 200 metres, but Clyne rallied again as the route twisted through the grounds of Rannoch School. By 24 miles, the two men were again locked together in an exciting dogfight, before Fraser’s final effort saw him finish 38 seconds ahead in a course record (2.23.08). Undeterred, Terry went on to win the Belfast Marathon in 2.20.24. Four years later, Terry made one last attempt to win the Scottish Marathon again, at Greenock, but could only finish an isolated and weary third, in his slowest time (2.39.06). Still, that made a grand total of two gold, two silver and a bronze in this championship. 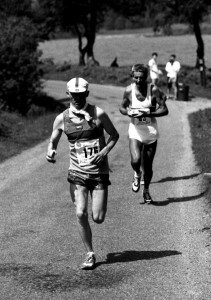 Years of participating in hill races, and training around hilly St Andrews and over the Lomond Hills, had prepared Terry Mitchell well for one of his finest races when, in 1994, he represented Scotland in the 10th World Mountain Running Trophy (at Berchtesgaden in Bavaria – near Hitler’s infamous “Eagle’s Nest” retreat). 115 athletes took part, and Terry finished a valiant 32nd, second Scot in a five man team, behind the redoubtable Bobby Quinn, who achieved 8th place. Terry has less pleasant memories of racing the Snowdonia event, which he completed once and once only! By the finish, the soles of his feet were skinless and, in considerable pain, he had to visit hospital every day for a week. Nobody had thought to tell him the secret to avoid such agony – simply wear two pairs of socks to reduce friction. Yet another event became Terry’s main annual target after this – the Scottish 50km Road Championship at Glenrothes in his home kingdom, Fife. In 1996 he won gold in an excellent Scottish record, which in 2010 still stands, of 3.02.27, with Moray Road Runners’ Simon Pride (who went on, three years later, to be World 100km champion) six minutes adrift. Terry also repeated his Belfast Marathon win (2.21.36). In 1998 Terry Mitchell ran the second-fastest Scottish time ever (3.03.46) to regain his 50km title. Amazingly, he also won this championship in 2001, 2002 and 2007, as well as winning silver medals in 2005 and 2006 and a bronze in 2009! The only adjustment to his marathon training for 50k was to extend the length of the Sunday run. And so he continues. Terry Mitchell now works for St Andrews University in Grounds Maintenance and his competitive spirit burns almost as fiercely as ever. His career in athletics is fascinating and seems to be unique in variety and longevity. A role model but a very hard act to follow!